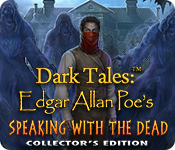 Dark Tales: Edgar Allan Poe's Speaking with the Dead Collector's Edition is rated 2.9 out of 5 by 13. Rated 5 out of 5 by biscuitsmama from THE DUPIN I LOVE IS BACK After either a facelift or a good long nap and an encounter with a razor, the Auguste Dupin I love is back. No more shaggy and worn around the edges Dupin in the game. Of course he still manages to act a bit bumbling as he directs me to do all of his running around, and it is rather impressive that the guy manages to look so fit with the lack of exercise he gets. At any rate Dupin is back in Dark Tales EAP’s Speaking with the Dead. As another reviewer said this is an excellent game and one that I’ve been waiting to see. As is the case in all AMEX (formerly ERS) games the graphics are top of the line. The characters are created to perfection which has always been a major draw for me with any game from this developer. As great as the characters are however, the dialog is downright corny sometimes bordering on ridiculous. The HOPS are excellent and one of the early ones in the game had me using the hint because the items were so well concealed. Of course there are far too many of the mini HOPS that I think are a bit lazy and an easy way out for us to find an item. I happen to love HOPS and that is true of the old school list type but I guess with gamers from all over the world playing these games, it is simply easier not to have to translate languages for the items to be found. As much as I loved the storyline and the HOPS, I can’t say the same for the puzzles. AMEX is one developer that still relies on the use of the click this or toggle that variety of puzzle and there were too many of those overly familiar ones in this game for my liking. I happened to skip almost all of them in this game and will go back to them one day when I feel that I have more of a tolerance for that model of puzzle. That being said, if I mostly ignore the puzzles this is an excellent game. The storyline is excellent and does contain a few surprises that I didn’t expect. I always love it when I am playing a game and then something comes along that I hadn’t figured out earlier. When this happens it always makes the game so much more fun, at least for me. As with most of the endless sequels here at BFG, I thought that Dark Tales EAP’s Speaking with the Dead would be a game I would skip but once I began playing I was hooked. I wasn’t even halfway through the demo before I decided that I wanted to play the full game and hit that buy button. Although I do think this is a wonderful game, please try the demo to see if you will enjoy this game as well. Happy gaming! Rated 5 out of 5 by sunnyglow from THE RESURRECTION OF AMAX IN A KILLER GAME! REVIEW BASED UPON THE ENTIRE GAME: 5 Chapters Plus a Bonus Chapter – Strategy Guide: 35 Pages OVERVIEW: Detective! Join forces with Auguste Dupin to solve another case. A hooded evildoer has emerged and is on the prowl. This time, the jurors from the trial of a scientist, Dr. Brian, have been kidnapped. Witnesses believe Dr. Brian himself is involved with these abductions; however, how can that be possible when he was executed? Now, as a juror in the trial, Dupin is a target as well. Help him escape the clutches of the person(s) involved and investigate the motive behind these kidnappings and apprehend the culprit(s). OPINION: What a fantastic game! I almost did not purchase this game do to the lackluster demo. This game is much better after the demo. This is one of the best games I have played from AMAX in some time. The story is superb. The story in the bonus chapter is even better. The pace is excellent. Instead of time-consuming HOP scenes, this game has many mini-HOP scenes which help maintain a good pace within the game. 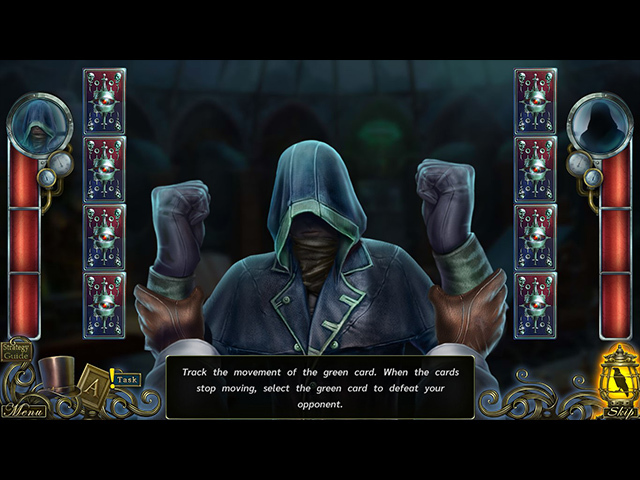 The game is well-illustrated with beautiful graphics. There are some wonderful puzzles and fantastic HOP scenes within this game. However, all these goodies appear AFTER the demo. MECHANICS: • 4 Levels of Play including a customized version. • 12 Achievements • Collect twenty-six (26) feathers and twenty-six (26) morphing objects • Nine (9) Wallpapers and five (5) Screensavers – Casual Art, Music and Movies • Replay fourteen (14) mini-games and fourteen (14) HOP scenes • 43 mini-games (10 of these are in the bonus chapter) • 38 HOP and mini-HOP scenes (12 of these are in the bonus chapter) BONUS CHAPTER: This is one of the best bonus chapters I have played. The bonus chapter is long and to me, more creatively designed than the main game. It is a prequel with the story set three (3) years before the main story. Brian Marsh is on trial for murder. In a court of law, review the scene of the crime as seen by three (3) witnesses, one of which is Dupin. There is some comic relief provided by the character of Jerome Smith, a soothsayer, along with some whimsical scenes with an adorable cat. There are ten (10) mini-games along with twelve (12) HOP scenes and mini-HOP scenes. There are three puzzles in the bonus chapter which can be played in either a “casual” or “hard” mode. The best puzzles, in my opinion, are in this chapter. HOP SCENES: Most of the scenes are lists of items. They are somewhat interactive. There are also storybook scenes, silhouette scenes, matching, and a few pattern scenes in which items are removed based on their pattern. My favorite is one in the bonus chapter which contains scenes on three different levels of a cabinet. This scene uses up-and-down arrows to change from scene-to-scene to not only remove items but to also move items to another level to be combined in some way. PUZZLES: Most of the puzzles are superb. They vary in style and difficulty. There are some extremely easy puzzles as well as a few difficult ones. Most are creatively designed. SPOILERS: HERE ARE SOME OF MY FAVORITE PUZZLES FROM THIS GAME: A. Sequence puzzle. Strategize moves as you try to light all the lights on a hexagon-shaped grid. Choose between arrows to light all the lights in the direction the arrow points. Continue until all lights are lit or until you are blocked when there are no free cells to light. When arrows disappear, you must start over. B. Sequence puzzle. Remove 4 horizontal bars by moving vertical bars with openings within them - up-and-down until all the openings center on each bar so it can be removed. Moving one vertical bar affects the others. C. Assembly puzzle. Place tokens with curved ends into a jewel box so that all tokens are connected. Awesome puzzle. D. Map puzzle. 2-dimensional puzzle in which you plot a course to reach a destination in six (6) moves while avoiding obstacles in your path. Press start to test your plotted course. E. Assembly puzzle. Using buttons at the side, move, rotate and increase and decrease the size of segments of the image of a raven until they align with the bird. BONUS CHAPTER: F. Choice between Casual and Hard. Maze puzzle. Plot a path through a honey-combed maze moving from square to another while avoiding evil hooded ghostly specters in your path. G. Choice between Casual vs. Hard. Matching. Uncover cards and match like cards. If you make a mistake, the cards will move to other locations. Rated 4 out of 5 by bffan5 from Dark Tales: Edgar Allan Poe I love the Dark Tales BFG. They can't bring them on fast enough. Rated 4 out of 5 by ipprocessdoc from Not as bad as some have indicated This is based on the demo.... This game is supposed to be creepy and Poe-like so is mostly dark. But the darkness of the screen doesn't keep the player from seeing objects. You are also able to select the custom mode which allows the player to change the hint recharge time as well as the skip time. The HOPs are very easy with none of the objects really hidden. A couple of the puzzles were a tad difficult (for me, and I love puzzles) but some were very easy. A couple were the ones where selecting one object changes another object. There is a method to that so you just have to pay attention to it. The one where you had to change the entire board into the blue color was one that stumped me for a bit. :-( The demo ends in a way that I didn't see coming. I'd like to see how it goes so will probably buy this one. Play the demo to see if you fall in the group that hates this or the ones that think it's not bad. Rated 4 out of 5 by LikeAGoodStory from Not A Favorite Series But Still A Good Game I enjoyed the storyline in this game, although this is not a favorite series of mine. That's just a matter of personal preference and not a reflection on the series as a whole. The plot has some really great twists, AFTER the demo, as at least one reviewer has noted. In fact, the game is slow to start but once it is revealed that this is not the usual story, the pace picks up.That said, I sometimes had trouble with the logic of the story. 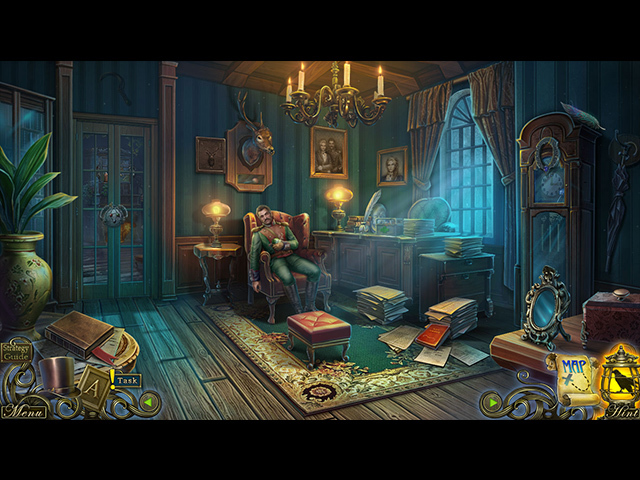 Hidden object scenes are easy and the puzzles mostly enjoyable. For me, this is a 3.5 game but certainly not a 3. If you enjoy the series, I think you will find this one of its best. Rated 3 out of 5 by dancemom1 from Dupin needs to recharge...maybe a long vacation Hello friends! As always, I review mostly on the game play and leave the story to those who do a much better job than I. Dupin is back, and looks and sounds more like his old self, this is a good thing. Still, he doesn't show any emotion when speaking. Looks like this might be #14 in this series. The graphics are nice and colors aren't too bad, although a bit muted, which makes the graphics seem a little fuzzy. Game play was very good, no problems during the demo and it fit my large screen. Not a lot of animation, but what we had was nice. Not sure why they thought they needed to bring a character closer to you when he/she was speaking, then back them up again...odd, but okay. Voices were the same as in the other games, but again, we do not speak. In other games in this series, we had to read dialog, but I didn't run across any of this during the demo. Music was quiet and moved with whatever was happening at the time. Sound FX weren't too bad, even with the annoying chime when an item was found, but we did have very nice storm FX when outside. Seem to have a few more HOPs in this one. 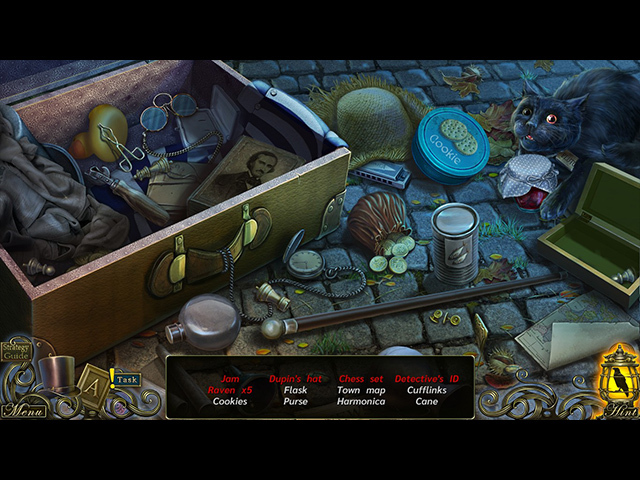 Items were not difficult to find and most of the scenes were fairly clear. They are somewhat varied, with some very interactive lists and silhouettes. I did not see that we could switch to anything else. Puzzles were nothing new and I only ran across one that was any challenge at all. I actually ended up skipping it! Hint system was quite helpful, but I did not see a transport feature during the demo. We really don't back track too far, but there is still enough. Collectibles were disappointing. We have to find 26 very large feathers to complete a bird. Not sure why, but these are very easy to spot. We also had 26 morphing items. These are varied and often quite difficult to see, as they are silhouettes and morph quickly. They are mostly in darker areas or on darker colors, making it the only challenge we have in this game. I don't remember this Poe story, so I don't know if it is true to his writing or not. Most of the others in this series were not. This was a predictable, simple story that moved slowly and had very little action or adventure. Dupin is losing his touch, he was caught much too early in the game. This could have been a very nice game without much work, but it definitely needs to either be updated or retired. I am sure some will like, but I do not feel this is CE worthy at all. Quite often, I find that the SE version makes a much better game, but I feel this is geared more to a true beginner. Gave this one a 3.5 on my scale. No buy for me. As always, give this one a try and see what you think. We all have different tastes in games and you may find this one to be exactly what you are looking for. Thanks for the reviews. Play on! Rated 2 out of 5 by RoshChodesh from Only Worth Playing Trial to See the Fire Dance If you like the Dark Tales EA Poe series, you won't like this one. I read the reviews and checked the static pictures and was not going to even try the trial until I read the reviews about the fire dance scene, I downloaded the trial just to see it and form my own opinion. Turns out my opinion is the same as other reviewers... it's hoot. I tried a thinking of a couple of songs to match the rhythm of their fire stomp. "I'm 'Bout to Lose My Mind, Up in Here" seemed to work well, "Hooked on a Feeling" did not. I would,like others, recommend downloading the trial to confirm it really is lackluster AND to see the fire dance. That was worth it, it made me laugh out loud and I had difficulty having my character extinguish the blaze because,well, it was too fun to watch the fire dance. Rated 2 out of 5 by ZekesPeach from Leave Me Alone! Another game that requires players to jump through all sorts of hoops before being able to freely explore. For example, in the very first location, I had to have at least one conversation, and literally do five other tasks before I could explore the room or even touch the collectible feather! And it doesn't get any better after that. There are, in my opinion, way too many cutscenes...again hindering progress...and while you can skip most dialogs and cutscenes, it is a never ending exercise in frustration that slows the whole game down. Dupin (or whatever his name is) adds nothing to the game...he basically stands around making inane comments about things that are obvious. Then there are the games where you need to replace things (like shards of mirror) and you are actually shown the outlines of each piece within the mirror frame. Where is the fun in that? The HOPs were fine; the feathers were easy to find. The morphs don't change into something else, they simply disappear, and reappear again after a fairly long pause. They can be very hard to spot if they are located on something dark in the scene. And where is there anything even remotely connected to Poe?? This whole series is just using his name to draw people in. Play the demo...you might like it...but I found it tedious and frustratingly slow. Rated 2 out of 5 by Pilot1 from Speaking of the dead, this game should be buried with them! Trite, banal, boring! If I wrote nothing more about this game, those three words sum it up to a certainty —as they did for the last six games of this series that I reviewed. Once more poor Edgar Allan Poe’s name and fame have been appropriated and used for what? For a poorly scripted, poorly plotted, poorly acted, trite, banal, and boring game. Yes, I used those three words again! What do we have here but the same tired story we’ve had a hundred times before. A woman kidnapped by an evil entity —yeah, that’s new and exciting. The same old HO sequences. The same old mini-games. And let’s not forget the same old graphics, same old dull background music. Despite the rave reviews some others have given this game —I simply cannot understand why they have done so, and I’m convinced that they must have played a different game than this demo. Folks, please, it wouldn’t you hurt to write an honest review! I’m sure that Big Fish will continue to feed you beta games. When I play a game, as when I read a book or watch a play, character development is a large part of my enjoying that particular media. In this game, as in others, such development is mostly absent. It is impossible to empathize with the flat, cartoonish characters who inhabit this game. I really don’t care what happens to them. Nor am I moved to any real effort to ‘rescue’ them from the predicaments which, more often than not, they become embroiled through their own ineptness. Edgar Allan Poe was the father of the ‘horror’ genre, but the only horror here is the audacity of the game developer to associate his name with this yet again lame offering. Don’t waste your download capacity or your time on yet another in a now long series of losers!